Broadly it was the first popular "Total War". Life on this planet has never been the same afterwards even among states which were non-combatants. 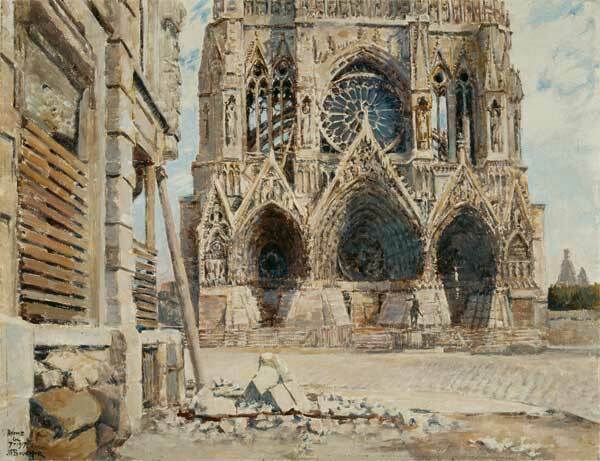 What happened at Reims and Soissons were no accidents. Soissons was also subject to this type of treatment. The cathedral was literally cut in half. But Total War did not come out of nowhere. "Clausewitz saw that the limited wars of the eighteenth century on which he had been brought up had been transformed into the total wars of the Napoleonic era – and all subsequent eras – not by any change in the nature of weaponry, but by the enlistment of “the people”; people whose emotions would distort the rational calculations of governments and the professional expertise of the military, but could never again be left out of account. Now there has been a further change. The paradigm (still largely accepted by Clausewitz) of “bipolar” wars fought between discrete states enjoying the support of their peoples has now been shattered by globalization. Popular support can no longer be taken for granted. “The people” are no longer homogeneous and the enemy is no longer a single entity. Further, “the enemy” is no longer the only actor to be taken into account. The information revolution means that every aspect, every incident of the conflict can be instantly broadcast throughout the world in width and in depth, and received by anyone with access to the internet; including the men in foxholes fighting it. Simpson explains, a “strategic narrative” is all-important. This is a public explanation of why one is at war at all, and how the military operations are devised to serve the strategy that will lead to the desired political outcome. Without such a narrative, no government can command the support of its people, nor, indeed, ensure effective planning by its armed forces – to say nothing of gaining the sympathy of “the strategic audience” beyond its own frontiers. The narrative must not only be persuasive in rational terms. It also needs drama to appeal to the emotions. Above all, it needs an ethical foundation. Not only one’s own people, but the wider “strategic audience” must believe that one is fighting a “good” war." "Certainly those days would seem to have come upon us of which Christ Our Lord foretold: "You shall hear of wars and rumours of wars - for nation shall rise against nation, and kingdom against kingdom" (Matt. xxiv, 6, 7). On every side the dread phantom of war holds sway: there is scarce room for another thought in the minds of men. The combatants are the greatest and wealthiest nations of the earth; what wonder, then, if, well provided with the most awful weapons modern military science has devised, they strive to destroy one another with refinements of horror.